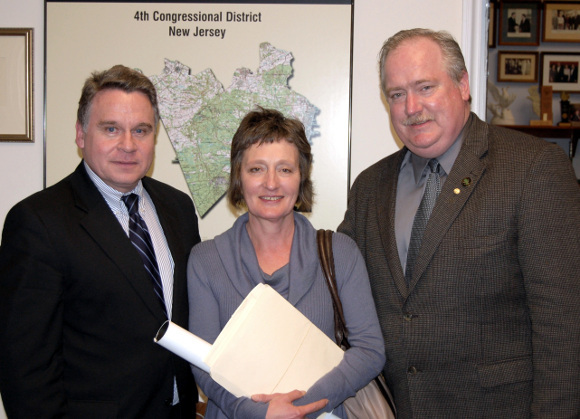 Congressman Chris Smith (Robbinsville, NJ) recently met with N.J. President of the Ancient Order of Hibernians and AOH National Board Member, Sean Pender of Hamilton, N.J., right, and Northern Ireland widow Geraldine Finucane, whose husband, human rights attorney Patrick Finucane, was murdered in 1989. Mrs. Finucane led a group of witnesses who testified March 21 before a congressional hearing chaired by Smith on human rights and the quest for justice in Northern Ireland. The resolution of her husband’s murder and other unresolved issues were discussed at the hearing. WASHINGTON, D.C. – Geraldine Finucane, widow of murdered human rights attorney Patrick Finucane, led a group of witnesses who testified Wednesday before a congressional hearing on human rights in Northern Ireland chaired by Rep. Chris Smith (NJ-04), Chairman of the U.S. Commission for Security and Cooperation in Europe (CSCE, also known as the U.S. Helsinki Commission). “In connection with the Good Friday peace agreement, the British government promised to conduct public inquiries into prominent, recommended cases where collusion is suspected,” said Smith, who has authored several bills and resolutions advancing the peace process and human rights in Northern Ireland. The hearing, entitled “Prerequisites for Progress in Northern Ireland,” was the 13th congressional hearing Smith has chaired on human rights in Northern Ireland. Most of the hearings have addressed issues of police reform and British collusion in human rights violations. Christopher Stanley of British-Irish Rights Watch, Mark Thompson, Director of Relatives for Justice, Brian Gormally, Director of Committee for the Administration of Justice, and Dr. Patricia Lundy of University of Ulster, also testified. Click on the names of the hearing’s witnesses below to read corresponding testimonies: Geraldine Finucane’s; Christopher Stanley; Mark Thompson; Brian Gormally, and; Dr. Patricia Lundy.